Glasgow-built HMS Bulolo rescued Dutch internees from the Japanese at the end of Word War II. Can anyone identify the children in the old photos? Many ships built on the River Clyde in Scotland went to war. HMS Bulolo was just one of them. In fact, this 6267-tonner was built in 1938 at the Barclay Curle yard in Glasgow as the MV Bulolo for an Australia-New Guinea service run by Burns Philip on a British Commonwealth contract. (Pictured here) Anchorage unknown - but the guys off duty go ashore from HMS Bulolo for their first experience of a tropical beach, probably somewhere in Borneo. <<AT LEAST, THAT WAS THIS PHOTO'S FIRST CAPTION. In any family research, the story changes as new material becomes available - in this case my father's navy records in their original protective envelope (see the header). From them I learned he was transferred from HMS Bulolo to HMS Beachy Head. A quick check on Google images and, sure enough, that's Beachy Head, not Bulolo pictured here. 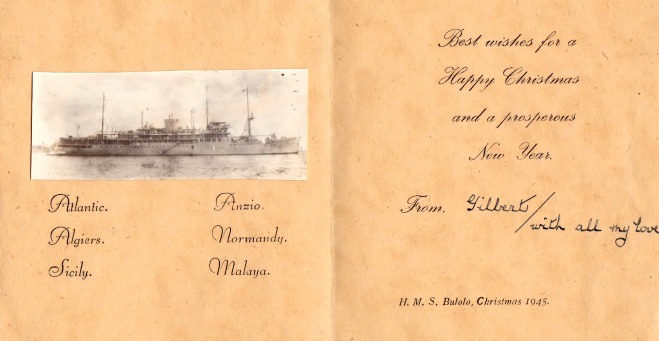 Anyway, to return to the original narrative, when World War II broke out HMS Bulolo was requisitioned, refitted as an armed merchant cruiser then later as a headquarters landing ship. To fulfil her latter role she was given state of the art communications capabilities and basically was in the thick of it thereafter. She took bomb damage at the Normandy landings, then was refitted again, this time to take her to the Far East early in 1945. That’s when Petty Officer Gilbert Summers went aboard. (At least I think that was his rank.) I suppose it was logical for a young man from a North-East Scotland fishing town (Fraserburgh) to join the navy. He was my father. (Pictured here) That's him at the top of the line in this uncropped squinty horizon snapshot. He seldom spoke about that Far East jaunt. Just some tales of Borneo and the strange noises one day on the jungle trail that led off from the beach. Every time he saw an orang-utan on tv it would prompt the story. Then there was that other tale. He related how, through half-closed eyes, half-awake in his hammock on deck, off-duty, at sea, he watched, uncomprehendingly, some unfortunate crew-member pack his case and jump over the rail - presumably because he couldn’t take the tension of sailing to some unknown destination - always a puzzle to me, that narrative. And Dad would sometimes say something about them being on an invasion fleet but the Americans dropped the bomb in time. And then he would change the subject. Too late now to ask. He died in 1998. Pictures of young men clowning about on a beach; of a military gathering on the steps of an imposing building; and, most mysterious of all, of women and young children at sea. Now, I've done some research. But like any Scottish family history, there's always more to do. I know that these pictures show the surrender of the Japanese at Singapore. “I looked at the dull impassive masks that were the faces of the Japanese generals and admirals seated opposite. Their plight moved me not at all. For them, I had none of the sympathy of soldier for soldier that by the fortune of war I had seen surrender. I knew too well what these men and those under their orders had done to their prisoners. They sat there apart from the rest of humanity. If I had no feeling for them, they, it seemed, had no feeling of any sort." - Field Marshal Lord Slim, Defeat into Victory. Other sources tell me that the ship took part in an earlier landing at Penang. Anyway, that date was ahead of the September 1945 signing of the surrender. And then there was the biggest mystery. Those women and children. Now that part has been solved. See the three pictures below. Shortly after the surrender, HMS Bulolo was sent off on a rescue mission to the city of Surabaya on what was then called Java. They returned with 500 Dutch civilian POWs. The Gurkhas, apparently, got them down to the harbour and kept at bay the already hostile Indonesian nationalists who appeared literally within days of the surrender. I have found out that the crew gave up bunks and cabins to accommodate the freed former prisoners of the Japanese on the voyage back to Singapore. And that they entertained the children on the voyage. (Pictured). What's going on here? Well, I reckon it's a waterslide rigged up for the kids by the crew. You can just make out the hose spraying the slide. Note destroyer in left background. On the way back - HMS Bulolo crew entertain the Dutch children with a fishing game. And here? Well, I think the crew filled a liferaft maybe and played fishing games. Wonder what the children caught? At sea with the Dutch women and children, Surabaya rescue mission. (Pictured here) Presumably on the Singapore voyage. Some of these kids would have been babies in the Surabaya internee camps. Where are they now? So that explains the pictures of a water slide and the liferaft (is it?) filled with water and the women seated on the deck. 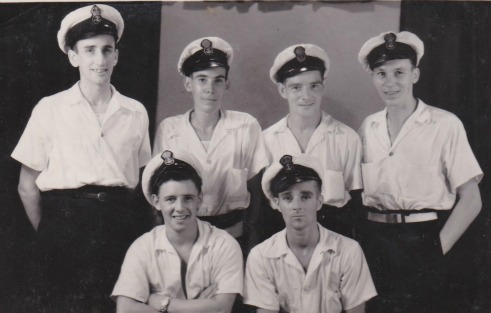 I now know that Lord Mountbatten assembled so-called RAPWI teams - Recovery of Allied Prisoners of War and Internees - and that Singapore was used as an assembly point for all kinds of POWs. Because of the barbarity of the Japanese - that nation back then without a trace of compassion or simple humanity- most of the unfortunates were in far worse state than the internees pictured here. Maybe it affected my father more than I ever knew. He never mentioned this voyage, nor much else in that year away from the little coastal Scottish town where he spent his entire life. He was always noticeably kind to children, hugely popular later on with his own grandchildren and their little friends. And, of course, he never experienced at first hand the utter degradation and mindless cruelty that was the hallmark of the Japanese in the Pacific theatre. His was a tiny mark in a very big picture. But isn’t it strange that unknown faces of Dutch children from more than seventy years ago, should emerge from a box kept in a little house in the north of Scotland? As for the transfer to HMS Beachy Head, as a late call-up, dad was to be only released from the navy later as well. He once told me he was involved in servicing minesweeper engines. Beachy Head is sometimes described as a submarine depot ship but - and I'll soon look into all this - presumably was a depot and base for the maintenance of the all-important minesweeping vessels - especially as all the mined channels could be safely swept after the cessation of hostilities. 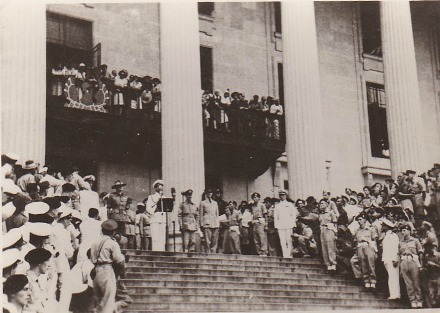 Eye-witness account of the Japanese surrender at Singapore, here, down the page a bit. The grimness of this account from the BBC history website speaks for itself. A period-piece from 1954 is And All the Trumpets by the late Donald Smith, who also had Aberdeenshire connections. He became the Rev J Donald Smith later in life. His book evokes the ghastliness of captivity under Japanese attitudes, yet somehow avoids rancour. The movie The Railway Man, from the late Eric Lomax’s book of the same name, was premiered at the Toronto International Film Festival in 2013, it stars Colin Firth and Nicole Kidman. Even more recently there was Angelina Jolie’s Unbroken - her first movie as Director and Producer. Again, from a book of the same name, It tells the story of Olympic athlete Louis Zamperini and his fate at the hands of his Japanese captors. If you are starting some Scottish ancestry research, take advantage of the range of great resources that Scotland offers.